Some of the major companies in the combat system integration market are Elbit Systems Ltd, Thales Group, ICI Services Corporation, DCS Corporation, Lockheed Martin Corporation, Qinetiq Group, BAE Systems, Raytheon Company, Leonardo-Finmeccanica, and Saab AB amongst others. These players are set to keep the combat system integration market at new heights. 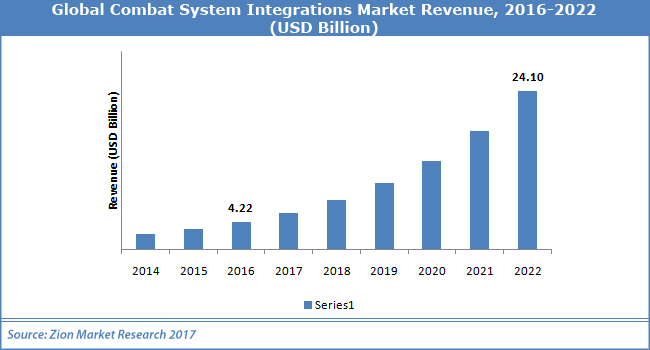 According to the experts at Zion Market Research, the Global combat system integration market added up for USD 4.22 Billion in 2016. The global combat system integration market is likely to cross USD 24.10 Billion by end of 2022, developing at a CAGR of almost 33.7% from 2017 to 2022. Development of enhanced combat systems for advanced situational awareness markets of North America and Europe is likely to drive the development of combat system integration market in years to come. Increasing requirement for networking unmanned systems paired with replenishment programs and current military modernization assists to further power development of combat system integrations market in the years to come. Increase in defense investment in developing nations, rising cases of terror attacks & armed conflicts, and increasing requirement for advancements of performance for combat platform are likely to power the development of combat system integrations market in coming years. On the other hand, dropping defense budget of developed nations might pose a hurdle for development combat system integrations market in the foreseeable future. Nonetheless, a massive R&D spending for technological enhancements in defense processes is likely to unlock new alluring chances in near future for combat system integrations market. For example, in September 2018, Saab received an order for new Carl-Gustaf M4 multi-role weapon system’s deliveries to the Australian Army. This is sixth client of Saab for the Carl-Gustaf M4 system since its roll out in 2014, boosting the combat system integration market. Submarine platform division in 2016 ruled the combat system integration market due to rising employment of military forces all over the world for diverse applications such as target tracking, acquisition, surveillance, and patrolling. Armored vehicles/artillery and fighter aircraft are expected to provide massive growth avenues for combat system integration market in the years to come. Naval application division held the biggest combat system integration market share in 2016. The development of this division is mainly credited to rise in the number of navy combat system modernization initiatives couple with the increase in defense investment. Land-based and airborne application divisions are also expected to experience noteworthy development in coming years in combat system integration market.